Nokia's latest flagship smartphone, the N97 (which follows on from the N96 and N95... creative) will be hitting UK shelves in July. Well, that's if the Vodafone site is to be believed, and as we all know, that's had a few problems in the past with predicting the correct arrival dates. Voda's site is listing the handset as 'Arriving in July', so users can register their interest in it and receive updates as and when they come. The N97 features one of the largest on-board memories of any phone at the moment, packing 32GB of storage with the possibility of adding in a 16GB microSD card to push it up to 48GB, though what you would need to do that for, short of replacing your iPod completely, is unclear. The N97 also features a lot of nice touches over the other touchscreen handset Nokia is shouting about at the moment, the 5800 XpressMusic. Check out our comparison to find out which one would suit you more prior to making your decision in July. 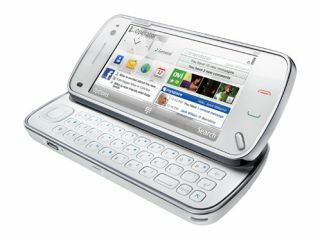 Nokia has announced sales of over 3 million for its debut 'proper' touchscreen phone, so it looks like 2009 will be a year with a nice touch for the Finnish company, despite some rocky times financially.